A low growing fine leaved bushy shrub with yellow flowers. 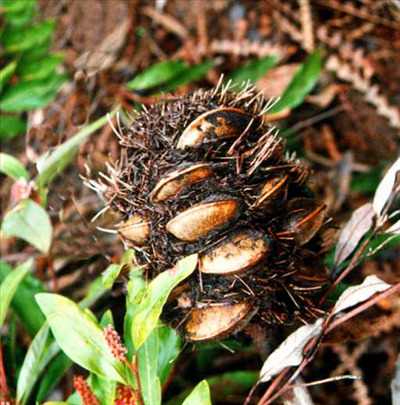 Grown for its ornamental seed cones which are excellent for cut flower displays. Tolerant of light frost but hardy to extended dry periods once established. Prefers well-drained light soils in full or partial sun. Grows well on the coast and is wind tolerant. Seedpods are used by artists - look for Obsidian Wind-chimes at various Festivals in the US.